From arranging fresh flowers, running bingo sessions and Happy Hour to painting vibrant murals, our HBH volunteers add colour in a variety of ways to the lives of our residents. Their help was recognised recently with a wine and cheese party to coincide with nationwide Volunteer Week celebrations. HBH has around 130 volunteers with about 90 of these on a regular roster. Our volunteers donate their time – an hour or more once or many times a week – to provide an array of HBH activities and services. Their involvement not only enriches the lives of our residents, but also allows staff to spend more time with residents. HBH Volunteer Programme coordinator Kim Thwaites says our volunteers come from a range of backgrounds. Many are retirees, some “have had family or friends at HBH and seen how great the place is”, some are new to NZ, and there are a lot of younger people offering their time too. 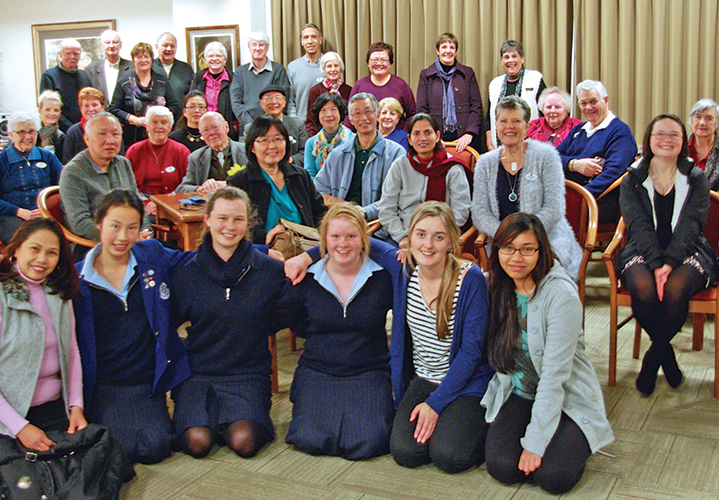 “We have high school students from Elim and Saint Kentigern college and university students who may be studying health or nursing.” Others volunteer at HBH because “ “they want to give back to the community.” Feedback from our residents shows that they really appreciate all the volunteers and love having the young people coming in. Two Macleans College students volunteer at weekends painting nails and two young teenage sisters come in to play board games with residents. It’s not all “at home” based activities, our volunteers also help with our weekly mini bus outings to beaches, gardens and parks, take residents to appointments or help our apartment residents with grocery shopping trips. Kim is always looking for ways to improve the Volunteer Programme and ensuring that it’s adding value wherever it can. It’s an HBH offering where care goes both ways – enriching the lives of our residents and our volunteers. Kim says to look out for large, colourful murals appearing at HBH later in the year – a fantastic initiative from student volunteers from Pakuranga College Art Department. Quality of care and quality of life: what’s the difference? Our residents are supported to be as active and independent as possible, with a range of services available at every level of care to ensure you make the most of life.